The one on the left is a life-size giclee print on canvas. The one on the right is the original oil painting. This photo was taken with only natural light, and one corner of the room was darker. The giclee print is virtually identical to the painting. To inquire about ordering a giclee, please use the contact form or email me at info@PatriciaWaldygo.com. Giclees can be printed either on paper or on canvas stretched on wooden stretchers. Prices include the cost of building a wooden crate for the canvas giclees and the 40" X 60" paper giclee, or a cardboard art box for smaller paper giclees, as well as New Mexico gross receipts tax of .07125%, which artists have to pay. The price does not include shipping. Fed Ex is the best method for all but the 40" X 60" giclees, which need to go via an art shipping company, due to Fed Ex's size restriction. For international customers whose countries have laws against importing wood that has not been fumigated (Australia, etc. ), giclees on canvas cannot be stretched on wooden stretchers. They will be printed on canvas and rolled up to be sent in a sturdy mailing tube. The customer would then need to have the giclee professionally mounted on stretchers after it arrives. 1) The painting is amazing. For those into the Qabalistic Tree of Life, it is an extraordinary representation of the concepts and symbolism behind this profound glyph. Looking at this painting is like a spiritual journey and dare I say a powerful aid and Cliffs notes to the concepts behind this meditative framework. (2) Dealing with Patricia is painless, absolutely professional, and utterly easy. She communicated with me at every step, took the utmost care to keep me informed, and went above and beyond to make sure a high-quality product was delivered to me in a timely fashion. Her attention to detail is great, and the quality of the final product is . . . AMAZING. The colors are gorgeous and vibrant, the framing/stretching is top notch, and there are zero defects. 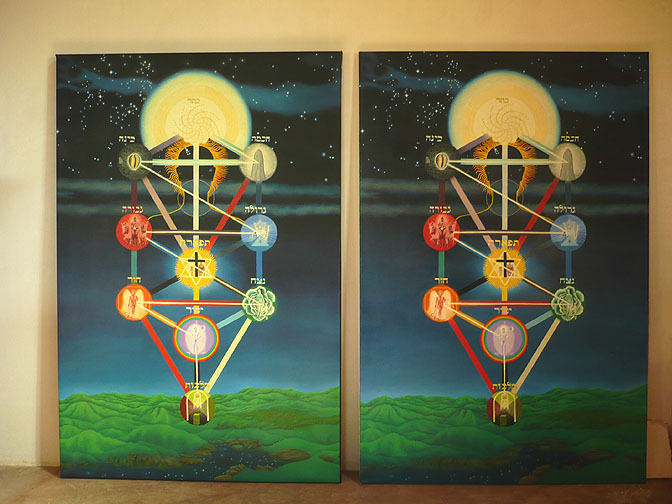 Recently, I purchased a life-size giclee from Patricia of her magnificent Tree of Life painting. My experiences with Patricia were absolutely wonderful. It was quite challenging working out how to get the giclee to Australia. There were all sorts of issues involving Australian Customs and Border Control in relation to timber and potential pests in the timber. Patricia very patiently and methodically worked through all the issues and options. In the end, the giclee was rolled into a cardboard carton and sent without any timber stretcher frames. Patricia did a beautiful job carefully packing the giclee. Fed Ex delivered the carton to Australia. Our local picture framing service mounted the giclee, and it looks beautiful. The quality of the print of the giclee is magnificent. The colours and the textures and the details are superb. I can recommend, without any reservation, purchasing a giclee from Patricia and having it transported in the manner described above.